Is it important? Can I do it at home? The answer is yes! Taking care of your pet’s teeth is the best way to keep dental disease (tartar, gingivitis, abscesses, etc.) at bay. Dental care and check-ups remain one of the most neglected areas of pet care, yet both are incredibly important for optimal health and quality of life. Mouth diseases are not just painful, they can lead to heart, lung and kidney disease if left untreated. Ideally, dental care begins at the puppy/kitten stage. However, it’s never too late to begin practicing good dental health care, so don’t let this dissuade you off if you have an adult/senior pet. Observing your pet’s eating routine allows you to stay on top of dental problems. Drooling, grinding teeth, reluctance to eat or drink cold water, avoiding chew toys, dropping food or chewing only with one side of the mouth can indicate problems. They are signs that your pet is in pain. Some pet–cats in particular–are very good at concealing problems. 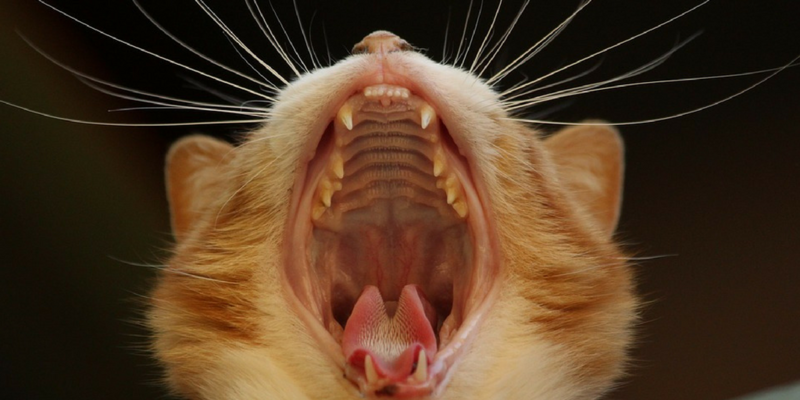 If your pet allows you to easily inspect his or her mouth, check for abnormal red gums (gingivitis), hard deposits of yellow/brownish material that form on the gum line (tartar), loose/broken teeth, tooth loss, pain around the mouth, abnormal growth and foul smell. If your pet does not let you check his mouth, ask your vet for assistance. Your vet can coach you on a proper home brushing routine once any problems are treated. How can I brush his teeth? The gold standard for preventive dental care is brushing your pet’s teeth daily. Many pets will allow you to brush their teeth if you establish this routine early in life or introduce it slowly. Be aware that human toothpaste is toxic for pets–use proper pet toothpaste. There are different types of toothbrushes so ask your vet for advice in choosing the one that better suits your pet. Start slowly, one step at a time. Practice the first step for one or two minutes a day until your pet tolerates it and then move to the next one and so on. Reassure your pet by massaging or petting his face when he is relaxed. Rub your finger on their teeth and gums without opening their mouth. Using chicken broth or tuna flavoured water may make this step more comfortable for your pet. Try and prep the gums by rubbing the front, back, upper and lower teeth. Prep your pet by simulating brushing its teeth by covering your finger with gauze and rubbing your pet’s teeth and gums in a circular motion. Introduce toothpaste by putting a bit on your finger and allowing the animal to taste it. It will probably take a little time for your pet to feel comfortable with the taste. If necessary, you can introduce toothpaste to a section of their mouth each day and build it up from there. Select a small, soft toothbrush for brushing your pet’s teeth. First, let him smell and become comfortable with the toothbrush. You can then softly brush his teeth as you did with your finger but without the paste. Once your pet is more comfortable with the toothbrush, add the toothpaste. If brushing the entire mouth at one time is difficult, consider brushing a section at a time. Dogs respond positively to having their teeth brushed by offering a treat as a reward. Remember give your pet cuddles and/or play breaks if they get stressed. The less stress your pet feels during routine home-brushings, the sooner your pet will tolerate dental maintenance. There is a variety of diets, treats, toys, gels and water additives developed to reduce the prevalence of plaque and tartar. Discuss your options with your vet at the yearly check-up!